I'm not usually keen on posting novelty hardware, but I must admit, I have a deep weakness for Dragon Quest's slimes. 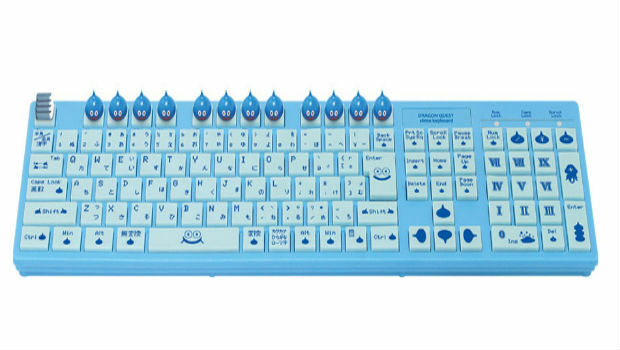 As a result, I found this Dragon Quest X-flavored keyboard from Hori too awesome to resist! There's a lot of really cool nuances on this keyboard, like the slimey smiley face on the spacebar, the staircase escape key, the DQ roman numeral keypad, and a ton of other unique icons. If the F1-12 slime caps look like they'd annoy the hell out of you, just know that you can remove them. I've never imported a piece of hardware before, but I think I may actually bite for this thing when it drops in August. The keyboard will cost ¥3,980 (approximately $50 US), and will come with a temporary in-game XP and gold boost for Dragon Quest X.
Hopefully we'll get some news on Dragon Quest X's western plans soon!